This week’s list of goodies was a nice balance of “WTHMORECUCUMBERS? !” and “Ohhhh Tomatoes!”. We even got a pair of small purple potatoes, which promptly were turned into purple potato chips with the remnants from a prior week’s veggie’s box. In fact, thanks to our local farmstand (which has a fishmonger truck on Fridays only), our dinner Friday night was entirely local: sea scallops from Provincetown, corn from the farm and potato chips made from the farm’s purple potatoes. SO GOOD. Now, lest you think we don’t have a plan for the heirlooms yet…guess again. DH has a basil plant at work (don’t judge – I think it’s wicked cool), and he brought home a container of freshly picked basil leaves to go with the heirlooms. And I will acquire some mozzarella. And then we shall have a caprese salad and ALL WILL BE RIGHT WITH THE WORLD. But lest anyone think I’ve gone crazy locavore and am planning to press my own olive oil…think again. Colavita is my friend. And it will still be awesome. The peppers will likely be snack-time for the kiddos, who are complete pepper-heads, and the wax beans may just get steamed and eaten with dinner. That’s the funny thing about some of these summer veggies: they’re so wonderful that the best preparation is often next-to-no work. Just wash, dry and eat. Or maybe wash, steam and eat. Zucchini and other squash do well on the grill (especially if you sprinkle some spices and herbs on top, or a mixture like Penzeys Greek Seasoning – a fan favorite in our household). It’s not until you start to get to the fall and all those winter squash that more prep really needs to come into play. So score one yet again for the veggie box – the simpler the preparation, the easier it is to incorporate into a busy schedule that leaves little time for elaborate dishes during the week. 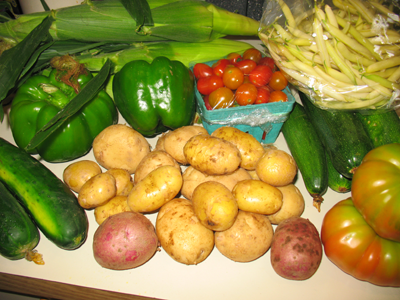 More on the value of the box in a later post…for now, I’m just going to enjoy making my (even brief) plans for all this lovely local veggie goodness. This entry was posted in locavore and tagged cooking, CSA, eat local, fruit, locavore, vegan, vegetables, vegetarian by crunchymetromom. Bookmark the permalink. I don’t think I’ve ever received wax beans and I really love them. I sort of forgot about them until reading this so I may have to cruise the market to see what I can find. Lovely haul 🙂 Thanks for linking up!